This one takes some explaining; it’s some of what’s been eating up my time for the past few weeks. This shot started life on HP5+ developed in Xtol. I digitally inverted and enlarged the shot and printed it on Pictorico Ultra Premium OHP before stuffing it in to my vacuum frame (yes, that shot shows me mis-printing a positive I printed first – oops). Traditionally, Cyanotype has a “part A” (green ferric ammonium citrate) and a “part B” (Potassium Ferricyanide). Usually you mix equal parts together, put it on paper, dry it, and expose it to UV light for a few minutes (outside) to an hour (under a UV light). Results are generally high-contrast and very very blue. This print was made with an alternative method – reportedly the same one that Sir John Hershel used, which has been generally forgotten. I stumbled across an old thread on some forum or other last week where this was mentioned in passing and decided I had to give it a try: instead of mixing parts A and B, you just coat the paper in part A and then expose it. Afterward you develop it in part B, and then wash it with water. The results are a substantially lower contrast print with excellent tonality. After initial printing, this was a typical cyanotype blue. I soaked it in coffee for about an hour to give it this final tone. My next print was going to be bleached (in borax or ammonia) and then toned (with coffee or tea) – but I broke my UV lamp instead, so that will have to wait a few days. I’m using a backup UV lamp that’s not nearly as bright and am printing 31-step wedges to see just how well this new technique works. 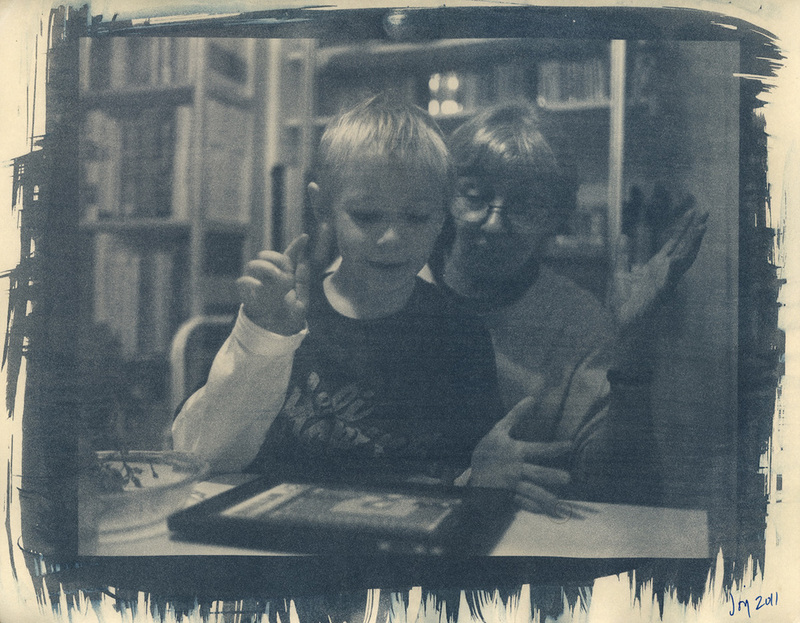 Of course this raised another set of questions for me: Mike Ware created a “New Cyanotype” recipe that is faster and offers a greater tonal range. (I use this too, and have to admit that it seems superior in many ways.) I have to wonder if it’s possible to use Ammonium Iron(III) Oxalate mixed with Ammonium Dichromate like the traditional “part A”, and then develop in Potassium Ferricyanide (same as the traditional “part B”). I think I’ll have to try this out the next time I mix up a new batch! Carey Lea used this method of making cyanotypes to avoid the crystallisation problem, and described it to the Annual Meeting of the British Association in 1863. Although this method was also advocated with enthusiasm in an annual editorial review by Traill-Taylor in 1889, it never passed into general practice, probably because the development bath rapidly becomes contaminated in use with excess sensitiser, which is clearly uneconomic in view of the price of potassium ferricyanide. So far, I see no mention of the relative speed difference between a mixed and non-mixed version of this application. Dr. Ware also points out (rightly) the expense and wastefulness of such a process if you use “part B” as a developing bath, due to the volume required and subsequent contamination of the developer.